Racing enthusiasts will be keen to hear that Audi’s new customer race sports car, the Audi R8 GRAND-AM, successfully passed final development tests last week at Daytona race track, Florida. Having completed these tests, the new Audi R8 GRAND-AMs will go out to the first lucky US customers in January. 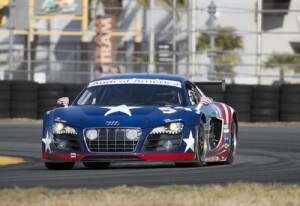 They will be able to use their new Audi’s to compete in January’s Daytona 24 Hours competition. Audi development driver Frank Stippler completed a gruelling 100km (600 miles) in the car in just two days, gathering vital information about the car’s performance and proving its mettle as a racer. The Audi R8 GRAND-AM is developed from the remarkable R8 LMS, which has claimed over 110 victories. One major hurdle the Audi engineering team faced was making the R8 competitive within the restraints of GRAND-AM regulations. These forbid modified body components and enforce a minimum height of 65 millimetres – 10 millimetres more than in the FIA series. To comply with the rules, the front underbody has a flat design, the front splitter extends by only 38mm from the front, and rear diffuser is similar to that used on mainstream production. The subsequent lower aerodynamics of the Audi R8 GRAND-AM means that softer spring rates and modified dampers are also necessary. It wasn’t just the Audi R8 GRAND-AM’s architecture that was altered. Standard safety elements like ABS and traction control are both turned off too. However, the Audi R8 GRAND-AM keeps the optimised radiator technology that features in the Audi R8 LMS. This all results in a much different vehicle to its GT3 ‘sister model’. The Audi R8 GRAND-AM is powered by a 5.2 litre V10 FSI engine. At the moment a specimen engine is being subjected to a thorough performance analysis by GRAND-AM engineers. It is only once this is complete and the rating announced that the engine’s power output and homologation weight will be declared. If you’re interested in buying or leasing a new vehicle contact our sales team. Alternatively, visit our website where you will find new and used Audi’s available for sale or on finance.